Page Street Publishing, 9781624147791, 208pp. When Melanie McDonald first became a vegan, she was disappointed in the lack of vibrant, flavorful vegan recipes available—so she created her own. Now, she shares all her favorite homey recipes, ensuring that everyone can enjoy tasty plant-based dishes. Pump up your mornings with Black Forest Breakfast Crepes or Rustic Skillet Potato and Greens Hash. Gather around the dinner table with family and friends to enjoy favorites like Soul-Warming Stew and Dumplings, Sticky Sweet-and-Sour Tofu and Rich and Saucy Bolognese. And satisfy all those between-meal cravings with sweets and snacks like Bangin’ BBQ Cauliflower Wings and Sky-High Apple Pie. 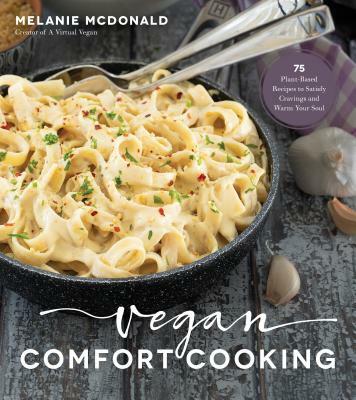 No matter the meal or occasion, Melanie’s recipes prove that the vegan versions of familiar favorites leave you feeling nourished and satisfied. Melanie McDonald is the founder of A Virtual Vegan. Her work has appeared in Parade, Vegan Food & Living, Reader’s Digest, Better Homes & Gardens, Good Housekeeping, Cosmopolitan and more. She lives in British Columbia, Canada, with her husband and son.